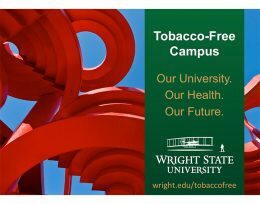 In order to promote a healthy environment in which to learn and work, Wright State University will become a tobacco-free campus on July 1, 2017. To help faculty, staff and students who wish to quit, the university is partnering with Public Health—Dayton and Montgomery County and WCORHA WELLScript to offer free tobacco cessation classes at the Dayton and Lake campuses. An eight-week group tobacco cessation class will be offered on Mondays, March 6 to April 24, from 12:30 to 1:30 p.m. in 117 Dwyer Hall. For more details or to register, contact Doug Newton at 937-775-5256 or doug.newton@wright.edu. For additional information, visit wright.edu/tobaccofree.